ଆପଣ ଇଣ୍ଟର୍ନେଟ୍ ସହିତ ସଂଯୋଜିତ ନୁହଁନ୍ତି. ଅନ୍‌ଲାଇନ୍ ସହାୟତା ପ୍ରାପ୍ତ କରିବାକୁ, ଯାହା ଆପଣଙ୍କୁ ନବୀନତମ ସହାୟତା ବିଷୟବସ୍ତୁ ଦେଖାଏ, ଆପଣଙ୍କୁ ଇଣ୍ଟର୍ନେଟ୍ ସହିତ ସଂଯୋଜିତ ହେବାକୁ ଆବଶ୍ୟକ. ଆପଣଙ୍କର ଇଣ୍ଟର୍ନେଟ୍ ସଂଯୋଜନ ଯାଞ୍ଚ କରନ୍ତୁ.ଯଦି ଆପଣ ବର୍ତ୍ତମାନ ମଧ୍ୟ ଏହି ବାର୍ତ୍ତା ଦେଖୁଛନ୍ତି, ଅନ୍‌ଲାଇନ୍ ସହାୟତା ସେବା ହୁଏତ ଅସ୍ଥାୟୀଭାବରେ ଅଣଉପଲବ୍ଧ ରହିବ. ପରେ ପୁନଃ ସଂଯୋଗ କରିବାକୁ ଚେଷ୍ଟା କରନ୍ତୁ. You hear when you get a call, select the Start Windows button, swipe over to the App list, and then select Settings > Personalization > Sounds. Under Ringtone, select the menu to choose a new ringtone. Looking for more ringtones? Swipe over to the App list, and then select Store and search for “ringtones.” You’ll find apps like Ringtone Maker, which lets you create and cut ringtones and notifications from the music on your phone. On your phone, go to Settings > Personalization > Sounds then select Ringtone to find and select your new ringtone. Groove ସହିତ ସହାୟତା ପାଇଁ, ଟାସ୍କଦଣ୍ଡିକାରେ ଥିବା ସନ୍ଧାନ ବାକ୍ସରେ ଆପଣଙ୍କ ପ୍ରଶ୍ନ ଏଣ୍ଟର୍‌ କରନ୍ତୁ. 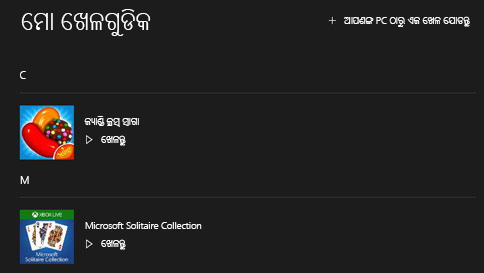 ଆପଣ Cortana କିମ୍ବା Bing ଠାରୁ ଉତ୍ତରଗୁଡିକ ପ୍ରାପ୍ତ କରିବେ. 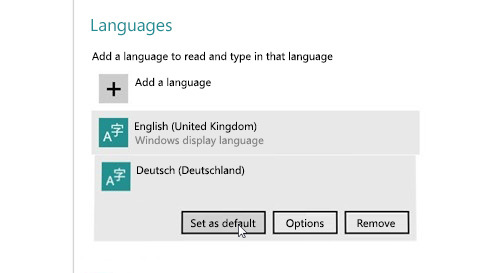 Author SupportPosted on 05/03/2016 Categories Windows 10Tags Windows 10, XboxLeave a comment on ମୋ pc ରେ xbox ଗେମ୍‍ କ୍ଲିପ‍ଗୁଡିକ ରେକର୍ଡ କରିବା ପାଇଁ କେଉଁ ହାର୍ଡୱେୟାର୍‍ ମୁଁ ଆବଶ୍ୟକ କରିବି? windows 10 mobile ରେ ମୋର ମୁଦ୍ରକ କେଉଁଠାରେ ଅଛି? ଏହି ତାଲିକାରେ ଆପଣଙ୍କର ମୁଦ୍ରକ ସନ୍ଧାନ କରିପାରିବେ ନାହିଁ କି? ଏହ ଟର୍ନ୍‍ ଅନ୍‍ ଥିବା ସହିତ ସମାନ Wi-Fi ନେଟ୍‍ୱାର୍କକୁ ଆପଣଙ୍କର ଫୋନ୍‍ ଭାବେ ସଂଯୋଗ ହୋଇଥିବା ନିଶ୍ଚିତ କରନ୍ତୁ. ଯଦି ଆପଣ ବର୍ତ୍ତମାନ ମଧ୍ୟ ଏହା ସନ୍ଧାନ କରିପାରିନାହାନ୍ତି, ଆପଣଙ୍କର ମୁଦ୍ରକ Windows 10 Mobile ମୁଦ୍ରଣ ସହିତ ସୁସଙ୍ଗତ କି ନାହିଁ ପରୀକ୍ଷଣ କରନ୍ତୁ. Author SupportPosted on 28/01/2016 28/01/2016 Categories Windows 10Tags Windows 10, Windows 10 MobileLeave a comment on windows 10 mobile ରେ ମୋର ମୁଦ୍ରକ କେଉଁଠାରେ ଅଛି? ଏଥିକୁ ଯାଆନ୍ତୁ ପ୍ରାରମ୍ଭ > Xbox > ମୋ ଖେଳଗୁଡିକ ଏବଂ ଯୁକ୍ତ ଚିହ୍ନ ଚୟନ କରନ୍ତୁ.